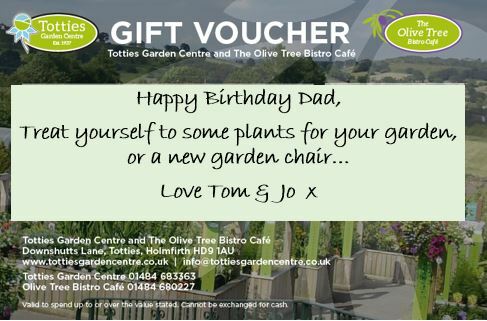 Our gift vouchers are available for the Garden Centre and The Olive Tree Bistro so the recipient can choose where to spend it; be it on plants, garden accessories, even compost! Alternatively they can come for breakfast, lunch, just coffee and cake. Vouchers are available to any amount in multiples of £5.00. If you would like £100.00 of vouchers, please add 20 to your basket. Vouchers are valid for 12 months from date of issue. 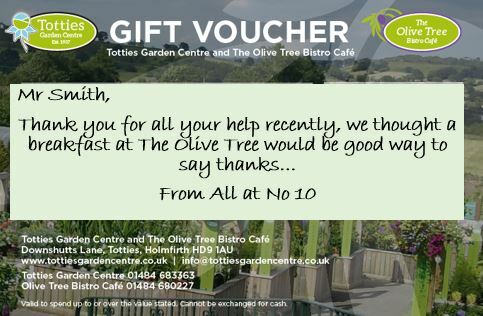 Our gift vouchers are available for the Garden Centre and The Olive Tree so the recipient can choose where to spend it; be it on plants, garden accessories, or even compost! Alternatively they can come for breakfast, lunch, just coffee and cake.